Samsung’s brand-new range of 4K TVs is out just in time for Black Friday, with prices that are sure to make them popular on the big day. But should you have one in your home? The 7020 range is available in four sizes – 43, 50, 55, and 65 inches – and none of them are costly. Prices range from £349 for the smallest model to £799 for the biggest. All the TVs in the 7020 range are around £100 cheaper than the range of TVs directly above them in Samsung’s 2018 line-up. Should any of these TVs be on your radar, or are they inferior Samsungs only built to cash in on the Black Friday mania? Spend less on Black Friday with one of our top five best cheap TVs. 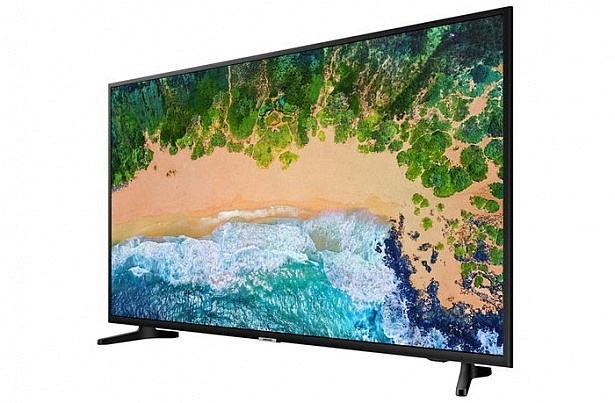 Though the price of Samsung TVs can vary anywhere from £349 to £3,499, there are several consistencies across the 17 4K ranges it released in 2018. The first is the operating system. Whether you’re planning on buying an entry-level 7020 or a high-end QLED, you’ll be greeted by the same Tizen smart platform when you turn the TV on. You can access all your favourite streaming and catch-up apps through Tizen and we found it to be simple to use when we tested it on other Samsung sets. Some of Samsung’s rivals don’t have this level of consistency. Sony, for example, uses Android TV for its pricier sets, but an inferior Linux-based operating system powers its cheaper ranges. The 7020 range is compatible with one of the most advanced HDR formats around, HDR10+; the current industry standard is called HDR10. While the benefits of it are clear when you see the vivid colours, inky blacks and dazzling whites that the contrast-boosting technology is capable of, sometimes HDR10 gets it wrong. Those impressive obsidian blacks and pearly whites can obscure detail, which is a tragedy when you’re watching crisp, defined 4K content. HDR10+ is Samsung’s answer to this problem. It adjusts contrast based on the needs of each scene and this adaptability should prevent detail from being lost. Despite it being one of the latest and most advanced formats, it can still be found on Samsung’s budget 7020 range. It also has Samsung’s new Universal Guide feature. It’s a recommendations tool that flags shows it thinks you might like based on your favourite genres. You can pin the channels you watch most here, too, for easier access later on. How has Samsung kept costs down? The 7020 range is a cheap one and there are some places where Samsung has stripped out features to keep prices low. 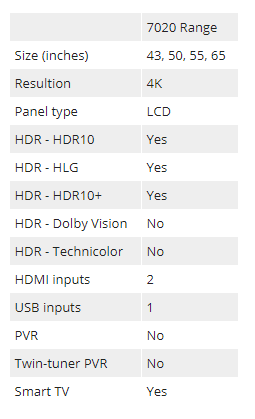 All of the sets in the range have just two HDMI inputs, which is one fewer than we’d expect to see even on low-end 4K sets. A measly two inputs doesn’t leave you much room to connect devices. Wire up a Blu-ray player and a sound bar, and your connections are used up, with no room for a TV streamer, cable TV box, or even a games console. It only has one USB port, too, which is again one fewer than we’d expect. With the 7020 however, it isn’t as big an issue as it would be with other TVs, although the reason why isn’t a good one. The 7020s don’t have a PVR, so you can’t record shows onto a USB hard drive. You can still watch anything you have saved onto a hard drive, but you only need the one USB input for that. Should the 7020 TVs be on your shortlist? Cheap doesn’t always equal bad and this year we’ve tested some budget sets that have done pretty well. We’ve also tested plenty that have failed at just about every aspect of what makes a good TV. Poor picture quality and atrocious sound tend to be more commonly found in TVs at the cheaper end of each brands’ range. So where does that leave the 7020? Since they were released so late in the year we haven’t had a chance to put them through our full lab test. 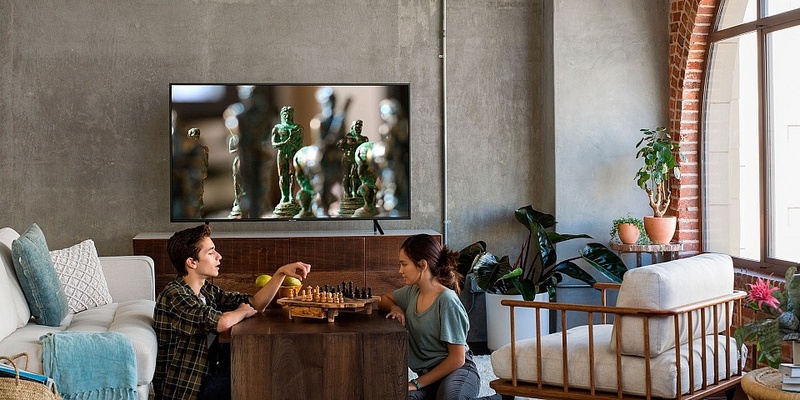 But we have tested most of the TVs that sit close to them in Samsung’s line up, and our comprehensive coverage gives us an unmatched understanding of what makes a good TV.